Heat oven to 350°F. Bake French loaf as directed on can. Cool until firm. Cut loaf into 1/4- to 1/2-inch slices. Place on ungreased cookie sheet. In small bowl, mix remaining bread ingredients. Brush mixture on one side of each bread slice. Bake 8 to 12 minutes or until golden brown and crisp. 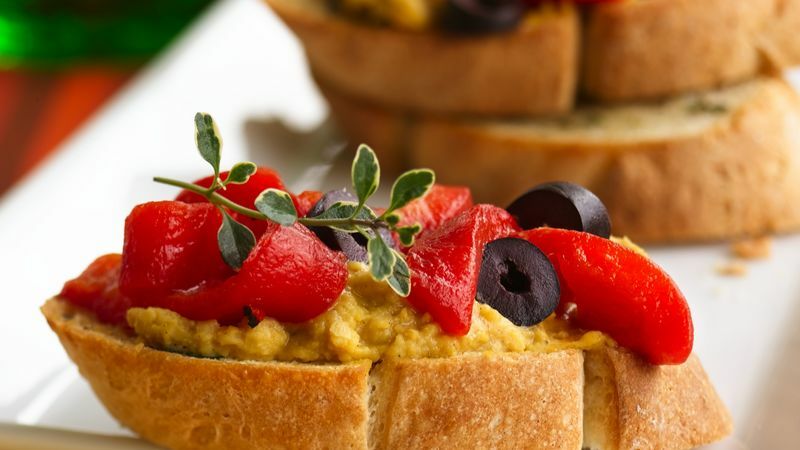 Spread hummus on each bread slice. Top each with roasted pepper strips and 1 olive slice. Garnish with fresh oregano. No fresh herbs on hand? Substitute 1/4 teaspoon of dried herbs for the fresh ones.